It seems from the comments on the Duke Nukem comic that a lot of people don’t really understand what Uncanny Valley is, or why it’s horrible and creepy and something no designer should approve of unless they’re in the horror business (in which case you need to push it to the limit). “Uncanny Valley” does not necessarily refer to things that are trying to be realistic, nor does it mean “anything you think is ugly”. Specifically, the term “Uncanny Valley” was meant to refer to robots, saying that people will like things that look like obvious abstractions of people, and people will like things that look exactly like people, but people are repulsed by things that look almost like people but not quite. You can hit up the Wikipedia page on the matter for an in-depth explanation of exactly what it means, but I broke it all down into easily digestible pictures of how this all relates to design because I felt like drawing toasters and gluing eyes on lions when I got home from work today. 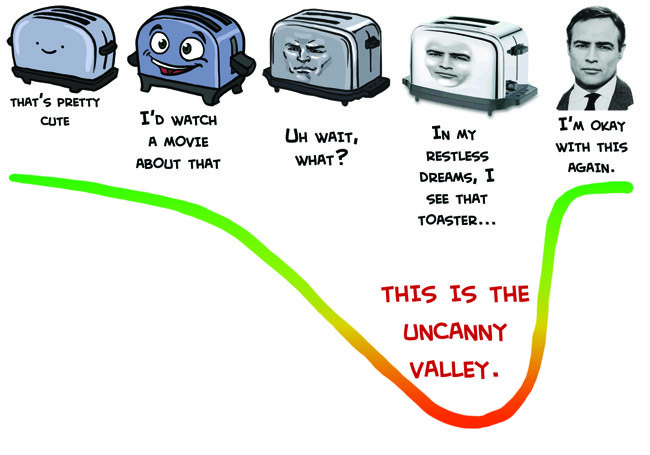 If we made a graph of how much people enjoy watching something move around VS level of realism, the “Uncanny Valley” is that dip where something is too much like a person without actually looking like a person for people to respond positively to it. It’s basically why Tweenbots and Arnold Schwarzenegger have an easier time making friends than the Japanese speaking robot mouth thing. If you want something non-human to emote like a human, you can’t just slap human eyes on it and call it a day. Back in the day sometime in first year animation class we were doing four-legged animal walk cycles, of animals randomly chosen out of a hat. The teacher warned us that people who got things like cats and dogs were probably going to have a harder time than people who got things like bears and raccoons, because people are so familiar with those animals that they’ll always notice right away if something looks wrong. This goes for anything people have a point of reference for. 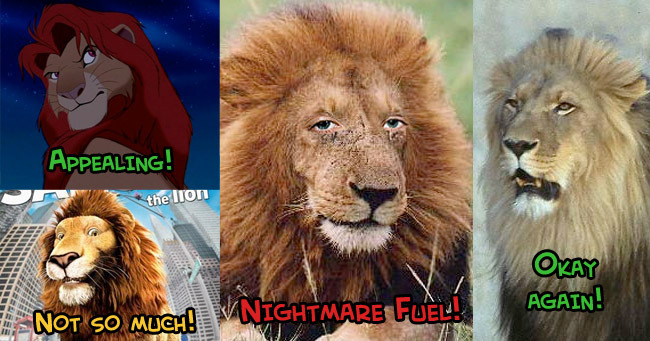 I would assume that furry art wouldn’t be quite as popular as it is if the cute cartoon girls were replaced with realistic human-animal mashups, at least. Which nicely segues into the rule of uncanny valley that most CG studios seem to be actively ignoring these days, which is that things should only have realistic texture if they have realistic proportions. Personally, I really hate the idea that cartoon animals should have hyper realistic fur. It makes them look like kids’ plush animals made out of real animal pelts (This is a real thing I have seen done, there is no worse way to show off that prized lynx you bagged than by skinning it and making a plush bunny out of it). Peter Jackson is all excited to talk about his realistic CG Tintin movie where you’ll be able to see all of Tintin’s pores and hair follicles, but honestly, cartoon characters with human skin stretched over them just look horrible. This is all really informal and I didn’t really have a conclusion planned, so I’ll just remind you to look at the Muppets with People Eyes tumblr every time you start feeling like Uncanny Valley isn’t all that bad. We’ve been warned that social media can distract us, shorten our attention spans, disconnect us from real-life relationships. Now a new study suggests that Facebook might also be making us miserable. I suspect there’s something to this, and it’s not just about Facebook. It’s about our churches. Slate magazine cites a paper in a social psychology journal that started with an observation about how college students felt more dejected after logging on to Facebook. There was something saddening about “scrolling through others’ attractive photos, accomplished bios, and chipper status updates.” The students’ moods were darkened because they believed everyone else was happier than they are. Journalist Libby Copeland speculates that Facebook might “have a special power to make us sadder and lonelier.” How can this be, though, when Facebook is generally so, well, happy, brimming with smiling faces and beautiful families? Well, that’s just the point. Yes, Copeland writes, Facebook can chronicle cute kids, and warm moments, but that is never the whole, or even most, of the story of anyone’s life. “Tearful falls and tantrums are rarely recorded, nor are the stretches of sheer mind-blowing,” she writes. Now, in one sense, I want to say, who really cares about Facebook. If you are that absorbed in comparing yourselves to others in this way, shut the computer screen and detox from the blue glow. But, it seems to me, the very same phenomenon is present in the pews of our Christian churches. This isn’t just a Greatest Generation revivalist problem either. Even those ubiquitous contemporary worship songs that come straight out of the Psalms tend to focus on psalms of ascent or psalms of joyful exuberance, not psalms of lament (and certainly not imprecatory psalms!). We can easily sing with the prophet Jeremiah, “great is thy faithfulness” (Lam. 3:23). But who can imagine singing, in church, with Jeremiah: “You have wrapped yourself with a cloud so that no prayer can pass through. You have made us scum and garbage among all the peoples” (Lam. 3:43-45). Of course we do. What else could we do? We’re joyful in the Lord, aren’t we? We want to encourage people, don’t we? And yet, what we’re trying to do isn’t working, even on the terms we’ve set for ourselves. I suspect many people in our pews look around them and think the others have the kind of happiness we keep promising, and wonder why it’s passed them by. By not speaking, where the Bible speaks, to the full range of human emotion—including loneliness, guilt, desolation, anger, fear, desperation—we only leave our people there, wondering why they just can’t be “Christian” enough to smile through it all. The gospel speaks a different word though. Jesus says, “Blessed are those who mourn, for they shall be comforted” (Matt. 5:4). In the kingdom, we receive comfort in a very different way than we’re taught to in American culture. We receive comfort not by, on the one hand, whining in our sense of entitlement or, on the other hand, pretending as though we’re happy. We are comforted when we see our sin, our brokenness, our desperate circumstances, and we grieve, we weep, we cry out for deliverance. That’s why James, the brother of our Lord, seems so out of step with the contemporary evangelical ethos. “Be wretched and mourn and weep,” he writes. “Let your laughter be turned to mourning and your joy to gloom” (Jas. 4:9). What would happen to a church leader who ended his service by saying to his people, “Have a wretched day!” or “I hope you all cry your eyes out this week!” It would sound crazy. Jesus always does sound crazy to us, at first (Jn. 7:15, 20). Nobody is as happy as he seems on Facebook. And no one is as “spiritual” as he seems in what we deem as “spiritual” enough for Christian worship. Maybe what we need in our churches is more tears, more failure, more confession of sin, more prayers of desperation that are too deep for words. Maybe then the lonely and the guilty and the desperate among us will see that the gospel has come not for the happy, but for the brokenhearted; not for the well, but for the sick; not for the found, but for the lost. So don’t worry about those shiny, happy people on Facebook. They need comfort, and deliverance, as much as you do. And, more importantly, let’s stop being those shiny, happy people when we gather in worship. Let’s not be embarrassed to shout for joy, and let’s not be embarrassed to weep in sorrow. Let’s train ourselves not for spin control, but for prayer, for repentance, for joy. Have a wretched day (and a blessed one too). This Guy Needs A Job! Holy crap! Producers out there, get this guy a job!